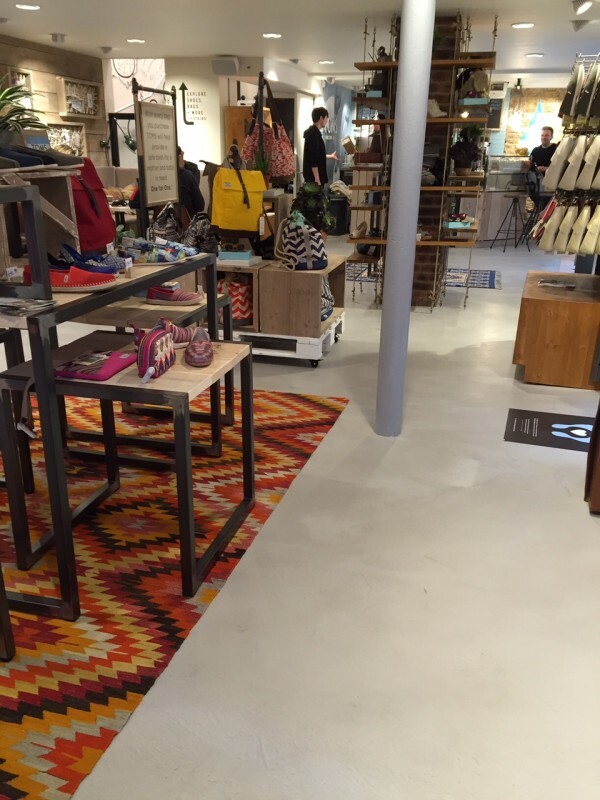 Our latest Solacir Interiors Microscreed floor has been installed at the new Toms store just off Carnaby Street in London. We are delighted to have worked with a such progressive company as Toms and encourage everyone who visits to see a Microscreed floor to buy something, even if it is just a coffee to earn the benefit of there ‘one to one’ charity scheme. It is hard to tell from the finished photos, but the existing floor is not solid, it is a suspended floor on timber joists. Floored Genius’ technical expertise has enabled us to engineer a solution to give the client a floor with a solid concrete finish. Refurbishment projects can be tricky, so a versatile material like Solacir Interiors’ Microscreed is ideal for an old building in London with an existing timber floor that requires a contemporary concrete finish. Only Solacir Interiors Microscreed has enough tensile strength to be laid on to suspended substrates. Don’t be fooled by cheap imitations !